The Pan-Valley Institute is preparing to present the 2017 Tamejavi Culture and Arts Series. 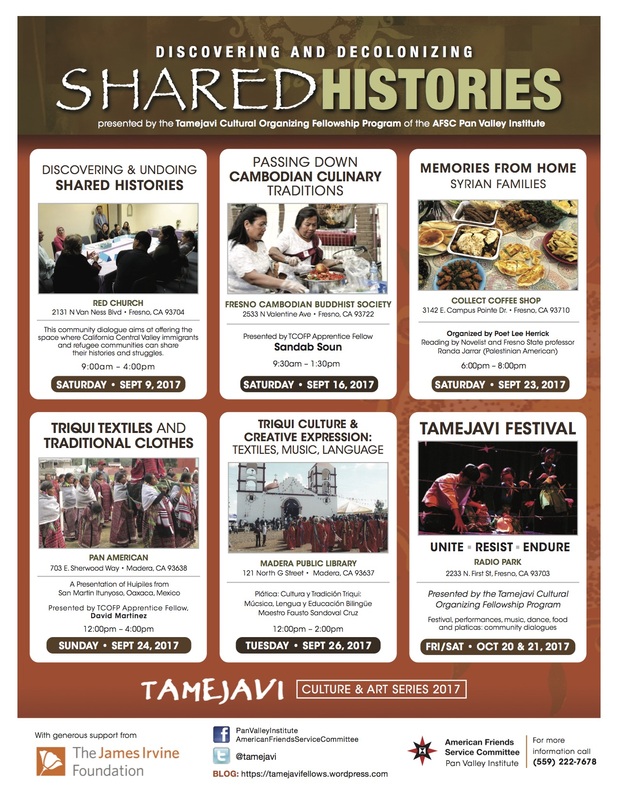 The Tamejavi Culture and Arts Series consists of public, story-based events that celebrate the culmination of the Tamejavi Cultural Organizing Fellowship Program, which encourages immigrants and refugees to become leaders and actors of change within their communities. Through their participation in the program, fellows learn the theory and practice of popular education, conduct community assessments and open spaces for public engagement and venues for their communities’ cultural and creative expression. This year’s series will respond to the current political climate that has exacerbated the narrative that presents immigrants and refugees as a threat to society. Fellows will use the program’s various art venues to take a stand against an increase in discrimination and social exclusion. This program aims to provide fellows with the tools necessary to form a deeper understanding of their communities, and gives Central Valley immigrants the unique opportunity to share, analyze and reflect on their individual and collective stories. By sparking a community dialogue, fellows are able to begin working toward the ultimate goal of inspiring community action towards social change, serving as a voice for those who would otherwise go unheard. The fellows, made up of Palestinian, Hmong, Pakistani, Indigenous Mexican (Zapoteco and Triqui) and Cambodian immigrants and refugees, have spent the past 18 months interacting in a multicultural environment, where they learn from each other, organized and hosted cultural exchanges within and beyond their own communities. Fellows participated in community visits around the San Joaquin Valley with the intention of expanding their knowledge of the Valley’s diversity, economic and social dynamics. At various events throughout September and October, the fellows will communicate their discoveries through a series of public projects titled “Discovering and Decolonizing Shared Histories.” The presentations and events will offer opportunities to engage in dialogue about their present struggles amidst a climate of racism, their memories and traditions from their homelands, as well as their cultural and creative expression traditions. The series, which began in July, will culminate with the VI Tamejavi Festival at Radio Park on Oct. 20 and 21. Follows is a schedule of upcoming events, which are free to the public. Saturday, Sept. 9 from 9 a.m. to 4 p.m. This community dialogue aims at providing a space where Central Valley immigrant and refugee communities can share their histories and struggles with the hope of finding a common ground for building solidarity bonds. Saturday, Sept. 16 from 9:30 a.m. to 1:30 p.m. Organized by Sandab Suon, this event will use Cambodian food as a means to bring the Cambodian community together to socialize and learn about their roots. Saturday, Sept. 23 from 6 to 8 p.m.
Sunday, Sept. 24 from noon to 4 p.m.
David Martinez’s presentation will offer Triqui women the opportunity to share their cultural tradition of textile weaving and embroidery. Tuesday, Sept. 26 from noon to 2 p.m. Maestro Fausto Sandoval Cruz will present an overview about Mexico’s indigenous Triqui people and the challenges they face in keeping their history, culture and language alive. At the VI Tamejavi Festival, human narratives of immigrants and refugees who have crossed borders, rivers and oceans to escape wars, violence, poverty and oppression will be shared. Proposed immigration policies like building a wall, enforcing a Muslim ban and punishing sanctuary cities will be exposed. This engaging event will feature music, dance, food, a poetry corner, a Time Tunnel and a Wall that will feature memories of immigrants and refugees at the time of departing. Please join us for an intimate look at how these emerging immigrant leaders learned to get in touch with their native cultures and traditions and sought ways to incorporate those into their communities here in the U.S. Putting a voice to the nation’s complex immigration problem and teaching fellows how to overcome the challenges they face is at the heart of the Tamejavi Culture and Arts Series. Pingback: "Memories from Home" event aids Syrian refugees in Fresno - FresYes!